Trying to become more self-sustainable…a little at a time. It was a busy weekend…seems like it always is. Not to mention busy all week long, but I am not complaining..there is something that can be said about being busy. We did accomplish a few things. You know how it goes…you make a list that has about a million to-do items, and consider it an accomplishment to cross a few off the list. One thing that we did get done is an item that has been on my “honey-do” list for quite a while. 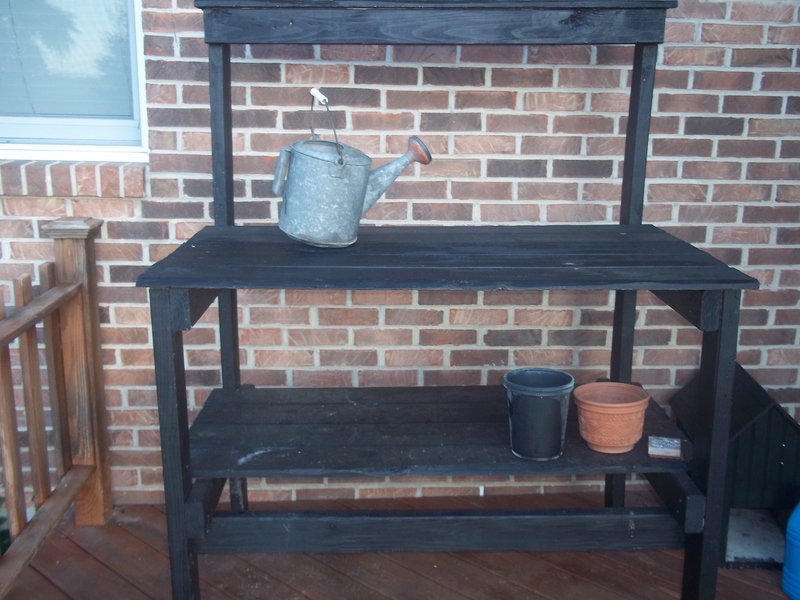 It took a little…persuading….ahem…but Chad (hubby) helped me get a potting bench put together from old pallets. It turned out pretty good..if I do say so myself. The kids helped me paint it, and it is now at home on my back deck. I like it. It will come in handy around here. I also had a big job ahead of me this weekend in the kitchen. Canning, freezing, and the like. We had someone give us some cucumbers (a little far gone..but they were free, so I gladly took them). Anytime I get “overgrown” cucumbers I make relish with them. The relish is good on meatloaf sandwiches, or whatever else floats your boat. Dice the cukes up in small pieces. Add to a bowl. Take canning jars and add the veggie mixture to the jars to fill. Fill the jars 3/4 way full with the vinegar, add some fresh dill, 1 tsp. salt (for a qt. ), and a few peppercorns. Top off with water. You can refrigerate to use fresh, or hot bath them to preserve them. I don’t have exact measurements. This is a made up recipe. I am a eye-baller. It’s just how I roll. If you have any questions, feel free to ask me. In addition to the massive cucumbers, you can probably see that I got some peppers. I pickled them. Alyssa (my 13 year old daughter) loves them pickled. Our peaches, blueberries, and cherries came in as well. The blueberries, and sour cherries I just froze so that went pretty quick. We did get some things accomplished though, and I am thankful for that. It has been a busy week on the farm. In addition to our normal duties, we have had “extra” chores popping up here and there. Our blackberries have come on…with a fierceness….that’s a good thing. We like to eat them. However, that is one more thing for the to-do list. So we have been picking…picking. As I have said previously, our garden is …sad…this year. It has just been one of those years. I have high hopes for our fall garden, however. We have managed to get a few peppers, a few tomatoes, and there are some green ones on there Praise the Lord…but everything else is at a stand still. I have been squirreling away everything that is offered to me from family; beets and potatoes (Thanks Granny! 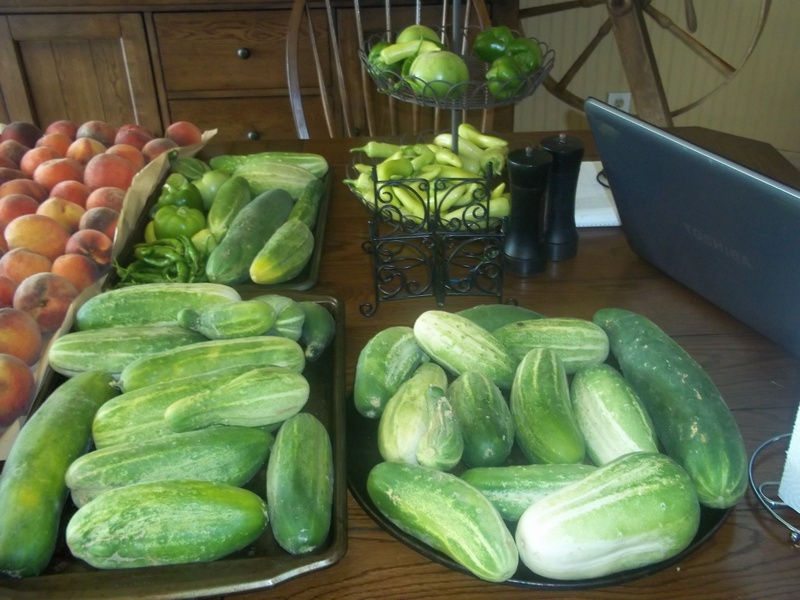 ), and beans, cucumbers, and more peppers (thanks Popaw Larry!). 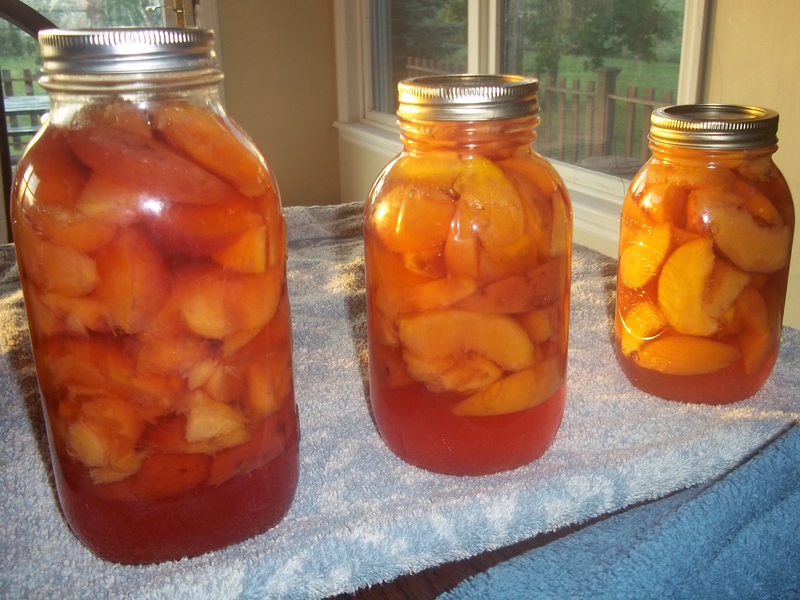 In addition to that, the Mennonites locally have me a bushel of peaches coming, along with 40 lb. 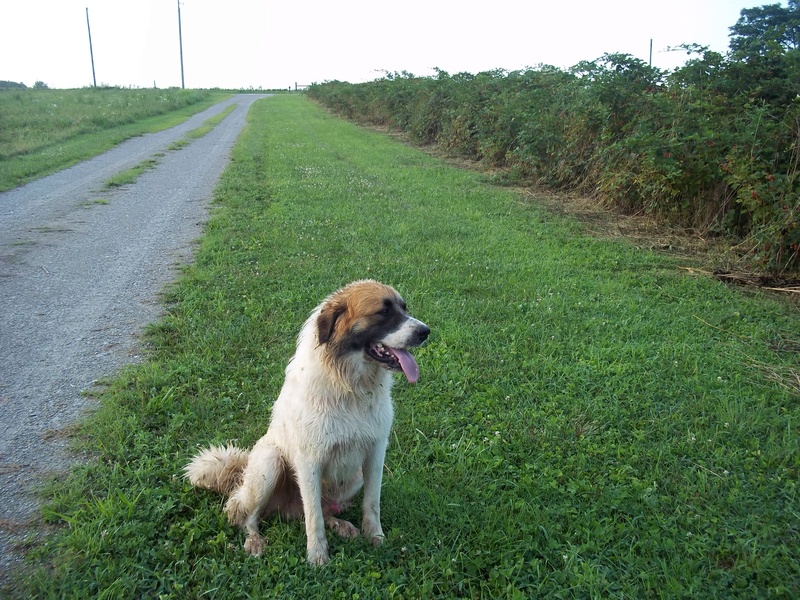 of blueberries, and 40 lb. of cherries. Yay! I have been picking blackberries everyday this week…I have been flash freezing them and putting them into jars. But, I am going to dry some, as well as make preserves. To flash freeze berries (or anything else) just place it one a single layer on a cookie sheet in the freezer until solid. After they are solid, place them into your jar, and label. Place back into the freezer and that’s it …..easy. You can put them into Ziploc bags if you like. I am just cheap. I have jars. So ..I use jars. The white and tan bunny the kids named “Ally”, and the darker bunny the kids named “Paisley”. They are precious. 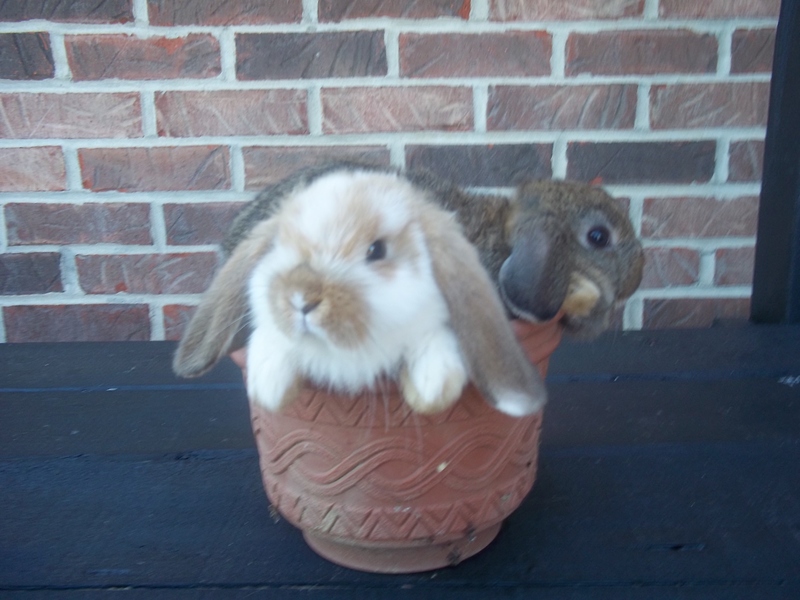 The other rabbits we raise are meat bunnies. They are Californians (white with red eyes)…I think that they look possessed…so I am okay with eating them. So..bunnies, and berries. Berries and bunnies. It’s been fun. 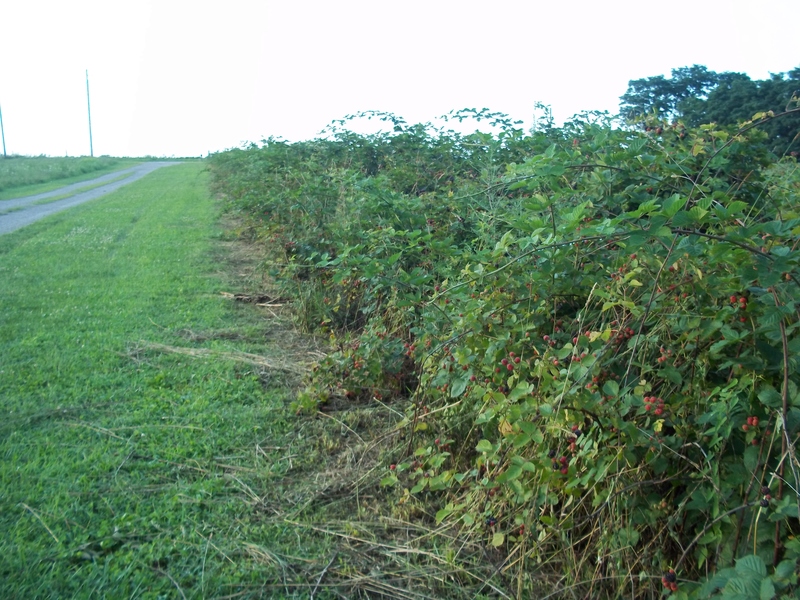 In fact we are picking more berries today. We also did get some herb plant markers finished. There was a million to choose from…of course Kyla the 8 year old wanted some that looked like bugs..I wasn’t digging those..the boys didn’t care they said. (go figure). 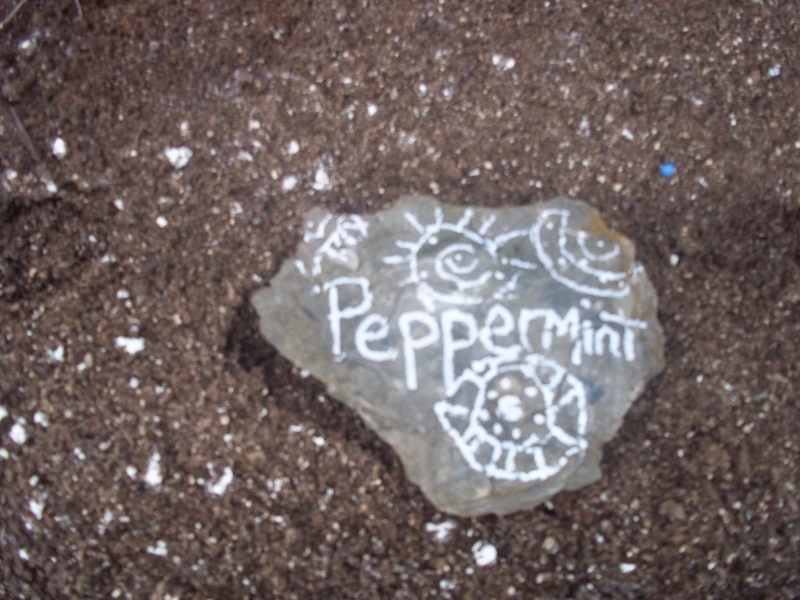 After trying to decide what type of plant markers to make ….The older girls picked out the rock type. I was fine with that because they were easy (not to mention free). We used a white paint marker and they drew on them, and wrote the name of the herb. Not anything spectacular, but it will look decent when the plants come in. So, that’s is our week…nothing fancy. To be honest, beets were on my least favorite list growing up. 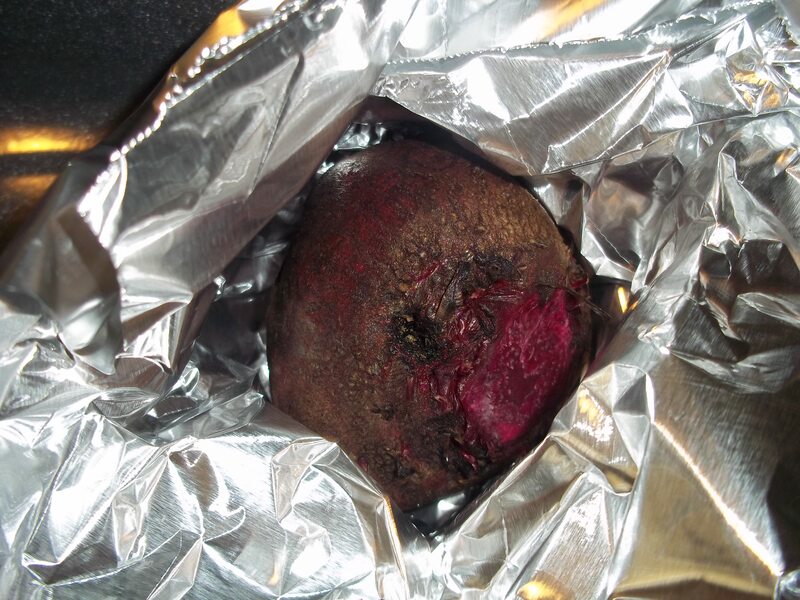 My only relationship with beets was the ones that came in a tin can that my grandma attempted to force feed me on a regular basis. Eew! Fast forward years and years to me sitting at the table with my husbands Granny who had spooned a big ‘ol helping of beets on my plate at dinner. I had to eat them. Granny just has a way about her. You can’t say no. You may want to, but your mouth cannot form the words…you smile and say “Okay” instead. So I prepared myself to fake a “yummy” face. But then…to my amazement…they were actually good. These homegrown, home cooked beets tasted NOTHING like the slimy store bought ones I loathed. 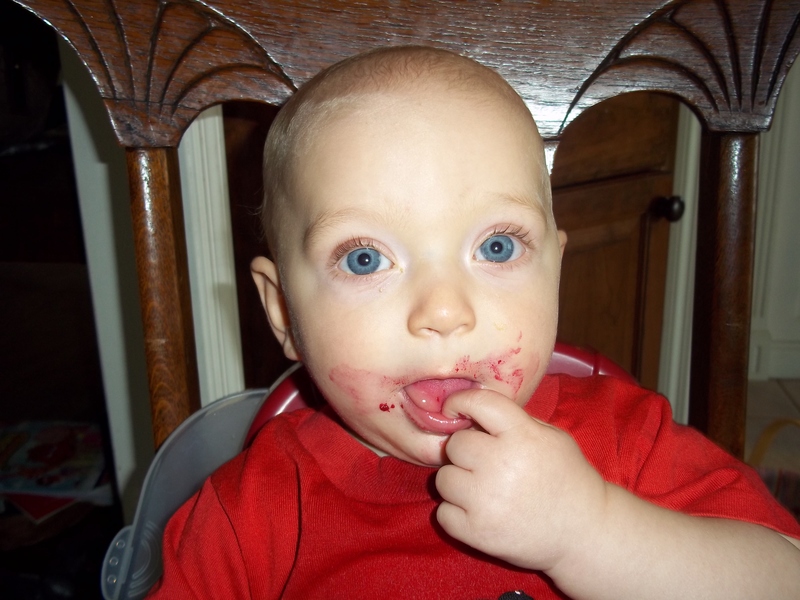 So now I like beets. Simply take your beets, coat them with olive oil, and sea salt. Individually wrap them in foil, place them on a baking sheet in an oven heated to 375 degrees. Roast the beets for about an or, or until tender. You can peel them, and slice them for eating….or you can freeze in freezer bags up to two months. The awesome thing is they taste fresh roasted after heating them in an oven again! I sometimes peel them…and sometimes I don’t. They are good both ways. Place the sliced beets in quart jars. In a small saucepan bring the remaining ingredients to a boil. Pour over beets. Refrigerate 3 to 7 days. You can also freeze or can these for future use. So…before you turn your nose up at beets…try these recipes..they are surprisingly good!